It is now time for the long-gestating post of our top 5 classic horror films. It is relevant to emphasize “classic”, as the films on this list could not have been produced after the turn of the century. It is also important to note that these are not necessarily the top 5 greatest films of all time. Who wants to see a repetitious list that inevitably ends with The Exorcist at number one? It is more-so a collaborative list of our favorite films. We both worked together on 4 of the 5 choices. We then each wrote out our reasons for those 4 choices. We then picked a single film of our own to round out the 5. So be prepared to agree with a couple, disagree with a couple, and perhaps find some level of enjoyment out of the experience. 4. Scream (1996)– While this is one of the collaborated-upon films, the decision to add this film to the list was more heavily influenced by Kyle. I fought it briefly for two reasons. Firstly, it isn’t a personal favorite of mine. Secondly, it is by far the most recent film on the list by a decade, which pushes the boundaries of the term “classic”. But over time, I believe the term “classic” will become a subjective word referring to a place in time before your generation. With film being a relatively recent medium, this will be a fairly new experience for movie patrons, but I’m sure it is bound to happen. But back to the film itself. Scream is a classic of the genre for numerous reasons. No reason is more important than the film’s influence on the genre and pop culture. 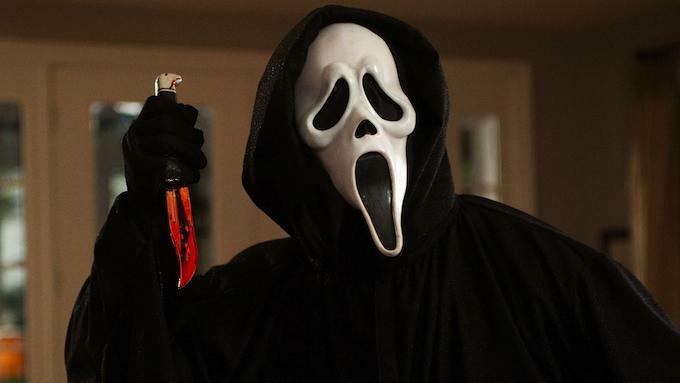 Scream popularized the concept of the horror parody and subtly introduced the concept of the modern horror comedy. These two impressive feats, combined with the overall quality of the film, places it in the category of “instant classics”. Appreciated for its clever heckles of the horror genre, while also delivering on tactful scares, this film bridged satirical dark comedy and legitimate horror themes in a way no film has done. Its success in this form led me to concede its place on the list. 3. The Thing (1982)– This film boasts practical effects that leave it in very exclusive company. Horror or not, this movie took visceral effects to an obscenely disturbing level. As is the case with most of John Carpenter’s films, The Thing went unappreciated upon its initial release. But it aged like a fine wine into the cult classic it is today. The Thing lacked consistent acting and was not without plot holes and frayed character motives, but the grotesque beauty, if there is such a thing, of the film makes it an undeniable top 5 classic. The Thing’s legacy is unfortunately a depressing one. Instead of inspiring a generation-transcendence of practical effects, it remains an oft-forgotten remnant of the pre-CGI age. CGI has allowed for the opportunity of expansive environments, epic battles, and unimaginable scenery that simply was and is not possible with practical effects. Shoe-string budgets, which is a common restraint of horror films, are able to do more with CGI available. But CGI is also overused and abused, particularly in the horror genre. Much of the fear instilled from the horror of the 80’s was its ability to attack the instinctive fight-or-flight response via effects that felt real. Even some of the weaker effects shook you because your mind still knew it was real material of some kind being mutilated. CGI allows the audience to separate from this sub-reality, and therefore horror often loses its edge. The Thing is one of the ancestors that whispers from its time that it hopes its spawn will hear its cautionary tale. If we don’t remember the past, we will be doomed to never repeat it. 2. Jaws (1975) – Though we were both quick to introduce Jaws to this list, it has been met with disdain on multiple occasions via the underground voices. The problem isn’t whether or not Jaws is a classic, but, is Jaws a horror movie at all. I am quick to say it is, and for multiple reasons. While the definition of horror seems clear-cut to some, I find it to be a very fluid and expansive genre that roots through various sub-genres. Jaws just happens to be such a great dramatic piece of cinema that its horror elements (and thriller label) seem secondary. But the influence of this film on American culture is nothing short of horrific. No film in history impacted the way a population responded in real life to what happened on screen. People in throngs literally avoided the water after seeing the film. Sharks were reportedly killed not for sport, for food, or for safety, but merely out of fear that it was a “man-eater”. Shark attacks retain a relatively low kill rate year-in and year-out, but that didn’t stop a generation of people from being traumatized by a film’s portrayal of the ocean’s top predator (next to the orca, of course, if we’re being technical). If a film scares a public into a level of mass fear, it seems to me the logical step would be to classify it as horror. But even the “thriller” genre has so many roots in horror that it is increasingly difficult to differentiate the two at times. Jaws is a perfect example, as most thrillers do not have an unnaturally large animal biting a man in half at their climax. But, as we can argue all day on the semantics of genre differentiation, let us stick to the proof of Jaws’ superiority and influence on horror. Jaws established a next-level of practical effects. Though the process of a giant robotic shark proved tedious, it led to a new level of advancement in technologies as they relate to practical effects in film. It became a blend of science and art that led to an execution of creativity in the most brilliant of ways. 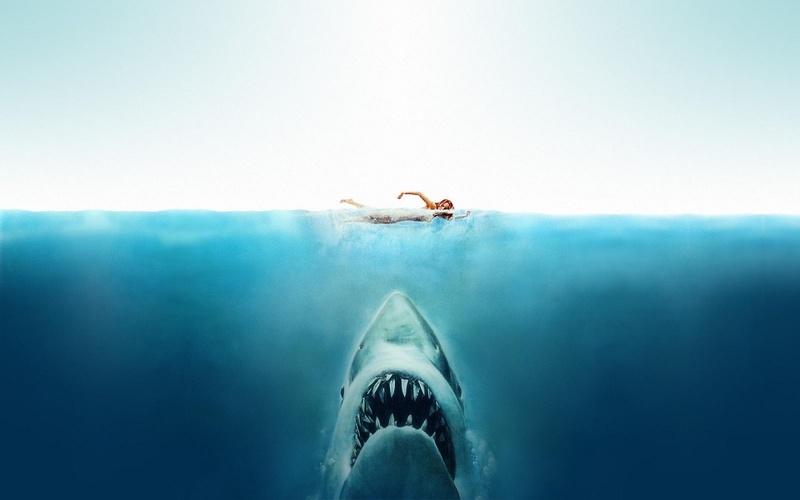 In many regards, the horror genre has Jaws to thank as the catalyst. 1. 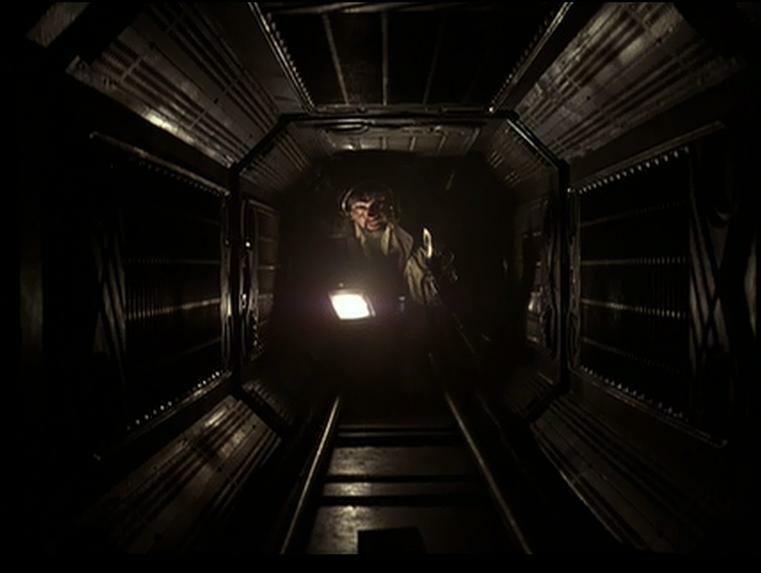 Alien (1979) – Placing this film on the list essentially broke two unspoken rules of the list. Number one: don’t repeat genres (The Thing stole the scifi/horror space). Number two: Try to avoid the obvious choices. These two rules were broken because we simply couldn’t deny this film’s responsibility for part of our obsession with the horror genre. Not only did it affect horror film history to this day, but it personally affected us as well. It set the standard for what makes a great horror film before the golden age of horror in the 80’s. Sadly, few films during the golden age reached the pinnacle Alien set. The genre quickly fell into a pattern of clichés and designated elements that became the standard of the genre and let it down a path of the mundane, unoriginal, and publicly unappreciated. Perhaps Alien set the bar too high. Ridley Scott joined in the early trend of fantastic directors taking their training wheels off with horror. And much like this exclusive company, his training wheels fell off while he was tearing through the horror, rather than falling off gradually after the film had completed. Alien boasts some of the best writing, acting, foreboding atmosphere, practical effects, scares and originality in the horror genre. While it is certainly arguable, the film is perhaps the only horror film to fully realize all of these attributes into a single film at this level of perfection. Well, it is less arguable to say that very few films come close. The iconic alien creature will forever be synonymous with the term “alien”, right along little green men. Editor’s Choice: The Fly (1986) – David Cronenberg’s The Fly is so vastly different and superior to the original film from 1958 that many movie patrons and critics forget about the original, or while acknowledging the original consider them two distinctly separate films. This happened in a day when remakes weren’t seen in the same light, with such significant advancements in technology allowing for noticeable improvements on commendable early film structures and themes. Simply the introduction of color was enough to entice remakes of certain action or effects-oriented films. The Fly from 1958 was one such film that caught the eye of Cronenberg and his fascination with mutilating the human body in what can only be described as creative ways. Cronenberg established himself as the master of body horror. He got his feet wet with films like Shivers, Rabid, The Brood, and Videodrome. Then came what many consider his masterpiece, right along with the critically-acclaimed/divided Naked Lunch: The Fly. Jeff Goldblum starred as the genius that was attempting to resolve expensive and time-consuming global travel via teleportation. The limitless possibilities led him to push the testing to dangerous heights when he uses the technology on himself. Unfortunately, he was fused with the DNA of a fly that came into the teleporter with him, which leads to our protagonist slowly turning into a half-human/half-fly monster. Of course, the scientist in him brings about a psychological adaptation that goes along with his grotesque transformation. It culminates into a very intriguing film that is sadly only accessible to those who aren’t squeamish or easily…”vomitable”. The film boasts great acting, an effective script, and powerful visual effects that leave the audience stunned, disgusted, and enthralled all at the same time. 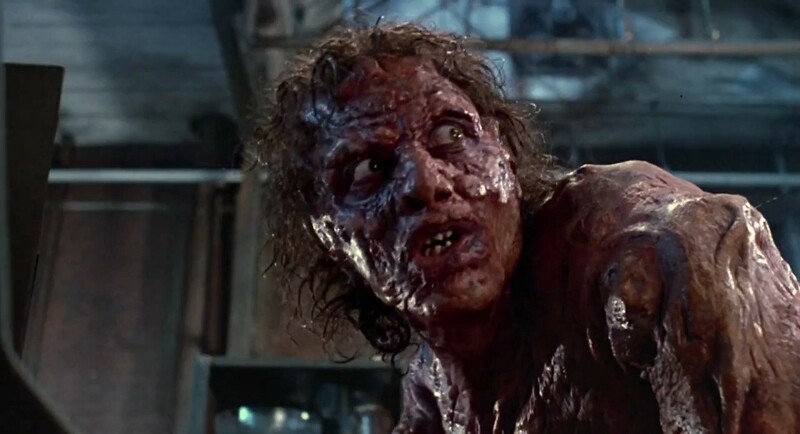 The Fly can hardly be held responsible for the current barrage of remakes we have experienced over the past two decades. The film wasn’t designed or perceived as a money-grubbing scheme from the production company, where many of these remakes today build off of poor scripts, weak CGI, and aspiring actors fresh out of dropping out of drama school. The Fly was something else. It is arguably the greatest horror remake of all time, and is certainly the realm of recognition outside of the category. As with any Cronenberg movie, it can be difficult to watch at times, but the film supplies so much more beyond its horrific elements that it was a pretty easy choice for me as my personal addition. If you would like to see what Kyle had to say about these movies, check out his article here!